Outdoor music always hooks into summer enjoyment and we all have our personal faves: I forever associate summer with songs like the classic 10cc pop hit from the ‘70s, “I’m Not in Love” or the Captain and Tennille’s “Love Will Keep Us Together.” Regardless of your musical tastes, outdoor music adds flavor to barbecues, poolside gatherings, or even just watching the sunset. Full disclosure here: of course we want you to purchase Axiom’s new weatherproof Algonquin Outdoor speakers, but regardless of what speakers you decide to get, there are issues about outdoor speaker placement, type, mounting, weather, wiring, and controlling speaker volume that you should consider. Axiom’s Algonquins are waterproof and UV-protected, but remember that any outdoor speaker is going to be subjected to extremes of temperature, cold, snow, rainstorms and wind. It’s prudent to consider a location under the eaves of your house, where the overhang will at least partly shield the speakers from direct assaults by harsh weather or roving birds. 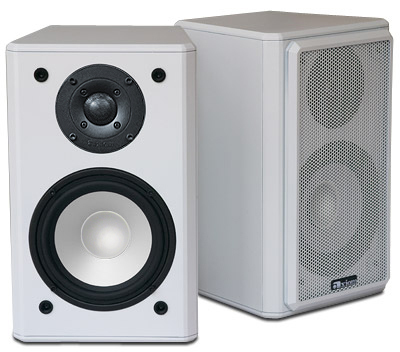 The Axiom Algonquin Outdoor Speakers in Arctic White. As to placement, while such issues as the stereo soundstage and imaging really don’t come into play to the same degree they do indoors, if you have a central patio area, it’s practical to put one speaker higher up to one side of the area and the other speaker on the other side--as far apart as you need in order to provide good coverage of the patio or pool. Don’t go overboard, though. If you separate two speakers by more than 20 feet, you and your guests will end up hearing whichever speaker is closest, with little output audible from the other. That may be OK for some setups, but if you use a swiveling, tilting bracket (hint: Axiom’s Full Metal Bracket) that lets you aim the two speakers toward the area you want to cover, you and your guests will enjoy a reasonable stereo effect as they lurch about the patio toward the refreshments. Professional installers generally recommend using one pair of outdoor speakers to cover an outdoor area between 200 and 400 square feet, which means a patio or deck measuring about 20 x 20 feet should be the maximum area served by a speaker pair. 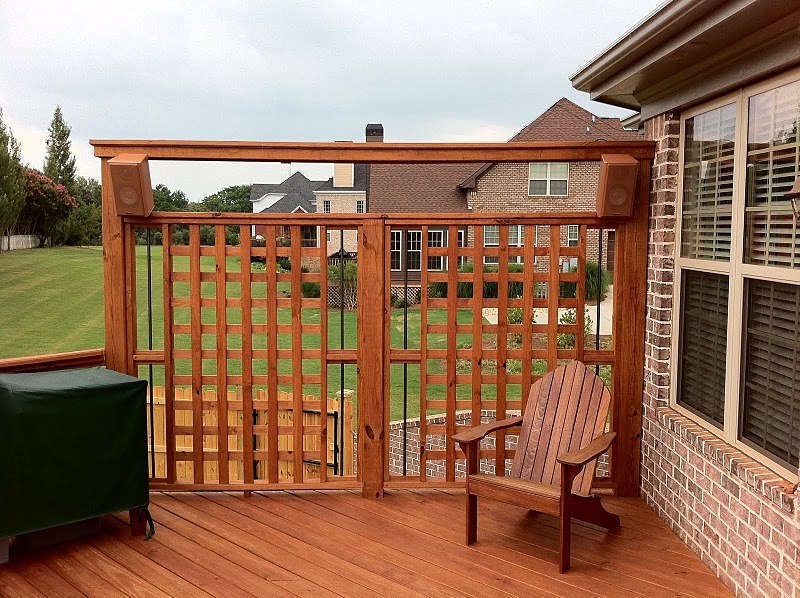 It’s worthwhile using a couple of stepladders as temporary speaker supports while you judge the sound coverage to the patio, deck or pool area from different locations. Do this before you start drilling holes for the speaker brackets and wiring. The fact is that almost all outdoor speakers use small sealed enclosures, but this severely limits bass output where you need it most--outside. 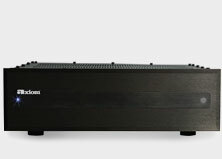 Axiom's Algonquin M3 is a bass-reflex design with a specially designed port that uses a screen to keep critters out and is angled so the rain will not get inside the speaker whether it is mounted horizontally or vertically. The screen is up inside at the end of the port and is not removable. Your outdoor speakers won’t have the usual boundaries common to indoor rooms—walls, ceiling and floors—which help reinforce the deep bass, so try and avoid mounting them on a post where there are no helpful boundaries to beef up the bass. Under the eaves, or, better yet, in a corner where the outdoor surfaces of the house meet, will supply some supportive bass reinforcement. 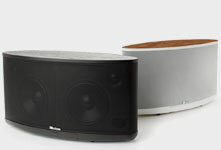 An outdoor speaker mounted between two intersecting surfaces under the eaves will increase its audible deep bass output by two times or more. 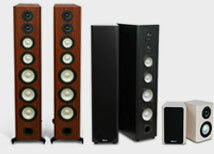 Outdoor speakers have to work harder because they fire into infinite space, so if you plan on using the Zone 2 outputs from your AV receiver or integrated amplifier to drive them, make certain the amplifiers have sufficient power output. As a party tempo increases, playback volume tends to rise, so an amplifier with at least 80 to 100 watts per channel should be considered. Don’t use some ancient stereo receiver from the basement storage room with 20 or 30 watts per channel-- the power demands for outdoor playback will likely drive the amp into clipping and damage the speakers. Don’t forget nearby homes or your neighbors across the water when you’re deciding on the speaker locations. Aiming the speakers from higher up down toward the patio or pool area and away from neighboring yards or houses will help focus the sound in your immediate area. For wiring runs longer than 40 feet, use 12-gauge speaker cable if you want to avoid losses from resistance. You can certainly use 14-gauge cable for distances of less than 40 feet with insignificant losses. For speaker locations away from the house at a pool or patio area, you should consider using 12-gauge direct-burial cable rather than running cable along the ground. Here are some guidelines for drilling and mounting speaker brackets, including Axiom's Full Metal Brackets, to various surfaces. With brick homes, you will need to use a masonry drill (available at hardware stores for a few dollars) of sufficient diameter to accept a concrete anchor or plug somewhat like the drywall plugs used indoors for bracket mounting. After drilling the hole, tap the concrete anchor into the hole and use stainless-steel (non-rusting) screws shorter than the concrete anchors to affix the bracket. Use some silicone seal or Goop around the screws to prevent moisture from getting into the brick. Concrete block surfaces may require using a hammer drill that both rotates and pounds the bit to penetrate the material. If you have aluminum or vinyl siding, you’ll need to drill through the siding (go through the narrower part at the top) to the material beneath—likely wood, plywood or studs—to anchor the wood screws. 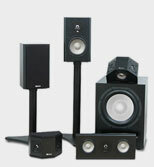 The vinyl or aluminum siding by itself isn’t strong enough to support the weight of a speaker and the bracket will sag. Seal around the screws and bracket with silicone or Goop to keep moisture out. Be very careful with stucco walls not to crack the stucco. Use a masonry drill to go through the stucco to the material beneath, likely wood, and wood screws for that material. With some cement-board or composite siding materials, a wood drill bit and screws will usually work fine. Again, be sure and use rust-proof screws and silicone seal around the screws and bracket. Wood or log siding is the easiest of all to anchor brackets to. Just use rust-proof wood screws of an appropriate size and length. Once you’ve determined where you are going to mount the speakers, you’ll still need to drill a hole through the wall for the speaker cable. You can locate that behind the speaker to conceal the wiring. Follow the aforementioned guidelines as to drill bits and wall materials. As to the speaker cabling, you can run that inside the walls to the exit holes you’ve just drilled through the wall surface. Leave enough extra cable outside the drill hole to form a drip loop—a U-shaped jog in the cable between the wall surface and the speaker terminals that will allow water to run down the cable and drip off the bottom of the loop, rather than flowing into the speaker terminals or running back into the hole for the speaker cable. Seal the hole in the wall with silicone or Goop. You’ll likely want to add some means of remotely controlling the volume of your outdoor speakers as well as changing discs or programming either by using an infra-red repeater that leads to your main AV receiver, an RF remote, or with an externally mounted volume control. Weather-resistant external level controllers and keypads can be obtained from various suppliers. A convenient no-hassle alternative would be to purchase an RF (radio frequency) remote control whose signals go through the walls to your AV receiver. Be sure to try one out to check its usable range (with an option to return it if the range is too limited or iffy). Depending on the wall surfaces (concrete or brick, especially), the operating range of an RF remote may be quite limited.